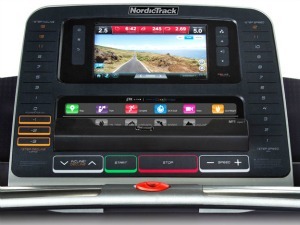 The NordicTrack Commercial 2150 treadmill lets you access workout videos in full color with iFit technology that brings the internet right onto your cardio fitness equipment. The console features a 10" full color iFit Tablet touch screen display that accesses the internet via your home’s wireless network. The built-in web browser, Powered by Android, lets you take advantage of full web surfing, viewing emails, and watching videos, as well as using the iFit Live™ feature for more advanced training workouts. UPDATE: The Commercial 2150 has been phased out to make way for the new NordicTrack Commercial 2450. Read our review of this model. 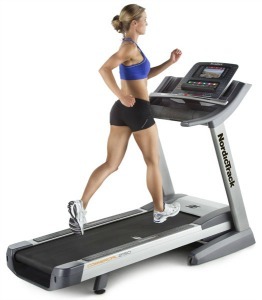 The NordicTrack Commercial 2150 treadmill has a number of excellent features such as the roomy 22" x 60" 2-ply tread belt, smooth 3" precision machined and balanced non-flex rear rollers, Quadflex™ Plus Cushioning to reduce joint impact up to 30%, 1-touch speed and incline controls, and a deck that has a 15% max incline plus a -3% decline. Indoor hill training has never been this much fun! What you get on the console represents state-of-the-art technology: the touch screen tablet that not only controls your manual treadmill settings and readouts for speed, time, distance, pulse, calories burned, etc., but is also a beautiful browser so you can follow virtual workout routes on Google Maps Street View, or run/walk to intense training programs designed by pro trainer Jillian Michaels. If you don’t want to use this feature, or don’t have a wireless network set up in your house, you still have the 36 built-in workouts and 2 high definition Video workouts of breathtaking views of Hawaii trails. 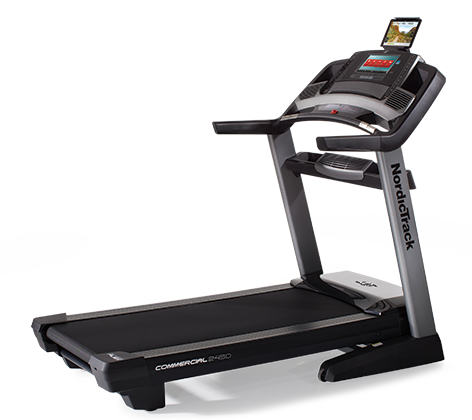 NordicTrack has scrubbed their TV treadmill line for the better quality tablet treadmills so that you can read emails, watch sports or the news, get on Facebook, etc., - basically expand your entertainment selections dramatically. You can also plug in your iPod or other MP3 device to play tunes through the in-console speakers. Keep in mind that the free year of iFit is a nice addition but once it ends, you’ll need to pay for iFit in subsequent years. The user reviews are overwhelmingly positive, and with free shipping, the NordicTrack Commercial 2150 treadmill comes in at $1,799 – a good price considering all that you get. This is a good buy, although the better value right now is probably the 1750 NordicTrack model at $1,499 which comes with nearly identical specs but sports a smaller 7” touch screen browser.